The philosopher physician returns and this time he brings his own ethics on happiness. However, his ethics sharply contrasts with that of the stoics putting forward hedonism over virtue (but not over the pleasure derived from collecting new knowledge it must be said). First published in 1748, while shacking up at Fredrick’s court, Anti-Seneca had gone through many revisions, rewritten many times by La Mettrie for the purpose of perfecting his morality drawn from his own interpretation of materialism. As is typical with our darling philosopher physician, contention, controversy and condemnation trails not far behind him with each published book. This one differed, not just with the usual condemnation by theologians but with philosophers from his own school of materialism. Truth be told, despite the title, the book is not solely about bashing Seneca or stoicism, only small chunks here and there that happens, instead it’s mostly about a wide variety of subjects discussing law, what defines happiness, the innate happiness of others, cynical views on virtue, attacks against an afterlife etc. Even though I adopt stoic philosophical tools in day-to-day life. Now and again a platform should be given to the contrarians. Let us lend our ears to the hedonists! Why not have something on this site to challenge stoicism! Why not be the devil’s advocate for a change? What makes a work like this great is that it’s controversial. Breeding controversy creates a dialectical dialogue, with the thesis (in this case stoicism) conflicting with its antithesis (La Mettrie’s hedonism) If there is a compromise between the thesis and antithesis then the result is something new called a synthesis. Controversy stimulates arguments and drama that we know all too well philosophers so love to engage! Organic happiness thus defined “the soul (mind) is not involved at all and can claim no credit for it (happiness), as it is independent of its will” in other words happiness derived from sensual gratification rather than thinking your way to happiness. La Mettrie points, to the fact that our bodily organs are capable of experiencing all sorts of pleasant sensations with its own degrees of magnitude too! What he’s trying to say is that pleasure from all our bodily senses are natural and good. So eating quality foods, smelling fragrances, intimacy, music and dancing etc. are all examples of our capabilities of experiencing corporeal pleasure and should not be condemned simply because it is innate. This fact is his testament that it is natural and good and should be acted upon as something done without remorse. Remorse is a feeling easily conquered by the passions and is smothered by it for a time only for it to be revived again when the state of passion has dissipated. Remorse is a ‘unpleasant remembrance’ which is antithetical to sustaining our enjoyments afterwards. So for example, you’re gripped by a state of passion whether for revenge or someone ‘struck a nerve’ in you etc. Then you proceed to carry out the act only to which later you feel remorse of having done it. However, La Mettrie’s argument is about remorse in regards towards pleasure not harming others. He agrees that we can be happy by doing nothing that leads to remorse, he condemns those individuals who after experiencing a pleasure and then thereafter repents and regrets on indulging the act as someone who is sacrificing his happiness ‘the more worried, agitated and tormented the soul is, the more bliss eludes it’. If we, instead, without remorse, indulge in a thousand sources of pleasure and a thousand sweet things, without harming no one then the happiness that ensues will be pure and uncorrupted by remorse. Cicero has seen to it that his virtue was praised as loudly as his eloquence Why? In order to acquire glory from it. Cato performs virtue for the sake of virtue or good for good’s sake to the detriment of his own fortune. It seems that true virtue is that same motivation as Cato, done for its own sake and not gaining any fortune from it. Similar to the Buddhist conception of true love, just wanting others to be happy rather than loving them because they make you happy. In short true virtue is selfless. La Mettrie’s account of why people pursue virtue is a cynical one. Virtue is seen here as a ladder to which when we acquire it we can gain prestige from it and be recognised for it rather than as something which will contribute towards our peace of mind. It was particularly La Mettrie’s views on laws, and the moral implication from them, that made his fellow materialists distance themselves from him. In La Mettrie’s eyes, the executioner who dispatches criminals is just as much a murderer as the starving (presumably poor) man who slits open the traveller’s throat with his blade, are they any more guilty? ‘Whether one is forced by justice or forced by misery, surely one is still forced?’ So what your La Mettrie is saying is that material conditions and life circumstances forced them to take the lives of others. Remorse is not enough to tame the tigers in our species, so for society, laws must be invented to create fears of the consequences of breaking the law and thus regulate the behaviour of all members of said society. Even the virtues that do exist are those created by society; a social product. Their value is determined by their usefulness. During his time, La Mettrie laments on how ignorant people can be so happy and at the same time be indifferent to the discovery of new truths whether in philosophy or science. It does not matter to them whether it is the earth or the sun that revolves or whether the earth is flat or round. As far as they are concerned we should let nature attend to its own devices and we go our own way of taking pleasure in eating, drinking, sleeping and vegetating. 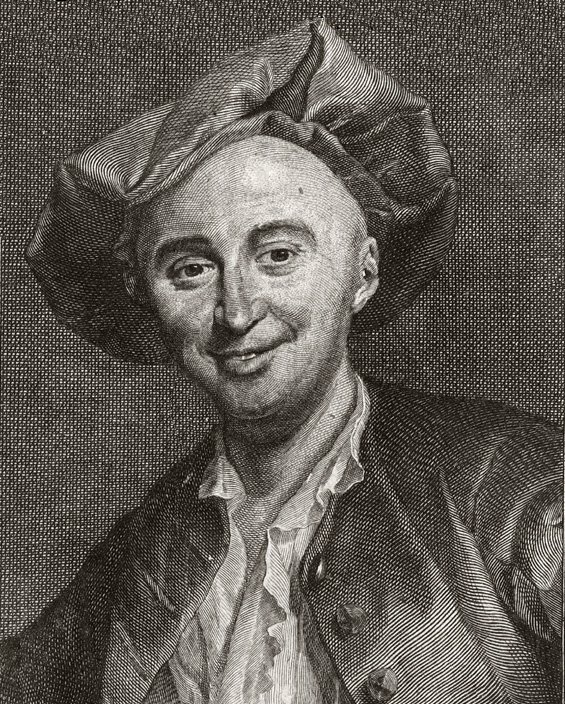 La Mettrie never wholeheartedly denied pleasure from the mind he often advocated happiness through education ‘happy was the man who was able to know the cause of things’ it was living by virtue that aroused his suspicion. Reflecting on this deeper, some people are more subject to joy , vanity, anger, melancholy and even remorse than are others (in other words, their temperament). Our physician chips in that this is all caused by either the inherited bodily organisation of the individual or at least changes of their organs that are conducive to happiness, rather than the immaterial soul no doubt. The type of happiness which ‘develops with our organs’ is the one he most preferred being similar he says to feeling and strength. However, not all people have the happiness that develops naturally from ‘our organs’, or (how I interpret this to be) our health, physique and genetic dispositions. It is often that our organs are not the best so we must get our happiness from elsewhere and so, the next best thing, as La Mettrie recommends, is education which can be acquired and give us happiness which we cannot find naturally in our physique etc. Even if the education contains a thousand sterile truths if it calms our soul by freeing us from all worries of the mind, then it is a source of happiness. In HBO’s Game of Thrones, in an episode of the first season, Jon Snow asks Tyrion Lannister why he reads so much books Tyrion replies ‘look at me and tell me what you see… what you see is a dwarf’ ‘My brother has his sword, and I have my mind. And a mind needs books like a sword needs a whetstone. That’s why I read so much, Jon Snow.’ That right there is improving the mind to compensate for what we lack in body. When it came to the question of death La Mettrie was frustrated that Seneca did not say, like Lucretius, that death does not concern us at all because it is not yet there when we are and we are no longer there when it is. From what I’ve gathered it seems to me La Mettrie was annoyed in stoicism for its emphasis on practicing virtue and foregoing pleasure (although the stoics were not ascetics!). Also La Mettrie was influenced by the epicureans which makes me thing that it may have influenced his attitude towards the stoics.